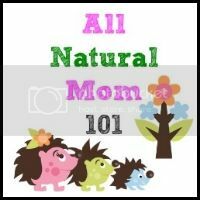 AllNaturalMom: Nommy's Nappies Review & Giveaway! 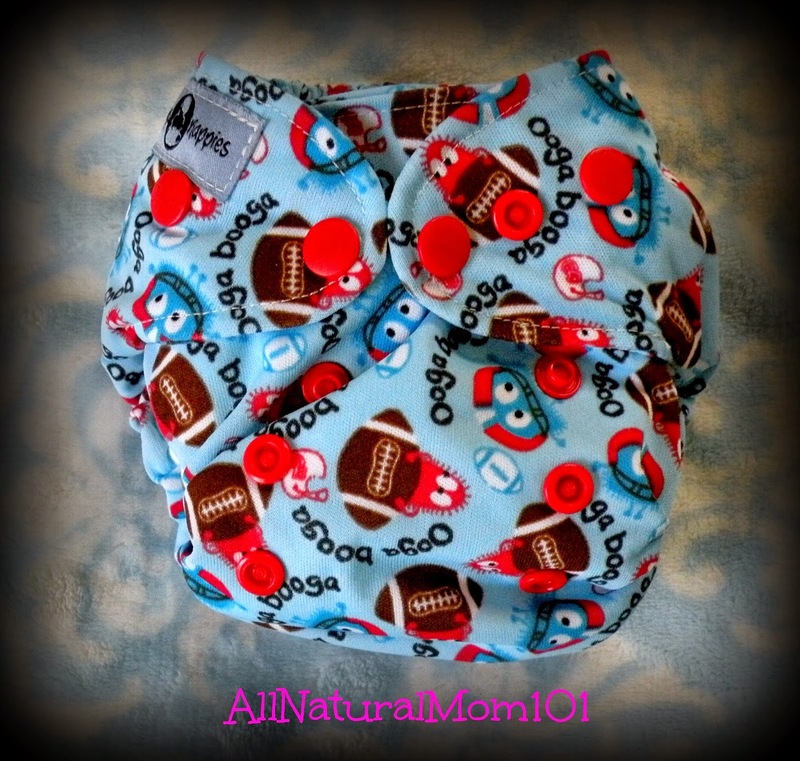 I have a huge love for cloth diapers, and I'm talking about all types: All-in-Ones, Pockets, All-in-twos, and Covers. The WAHM (work at home mom) behind Nommy's Nappies shares the same love. 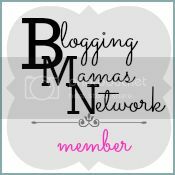 Nommy's Nappies is a home based business run by a mom who makes cloth diapers. 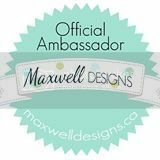 I am a huge supporter of WAHM brands, so I was excited to have the opportunity to review one of Nommy's Nappies. Nommy's Nappies sent me a Size Small AIO (all-in-one) diaper. The size small/petite AIO has three rows of rise snaps and two snaps on each wing, with a full crossover snap option to create a nice snug fit for baby. The outer layer can be made in either a solid color or a cute PUL print. 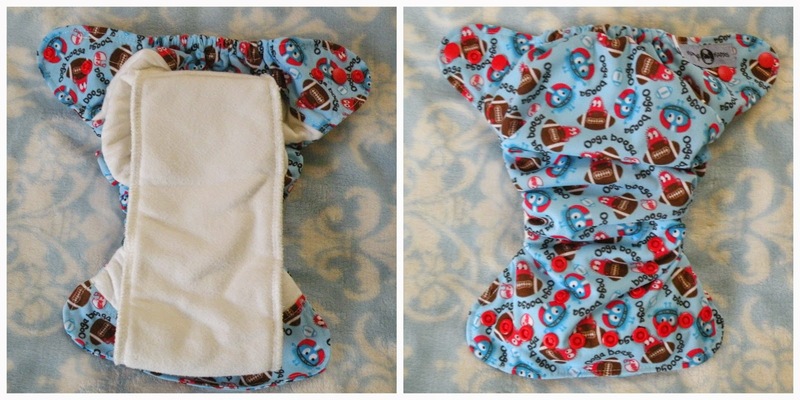 Inside you will find leak guards at the front and back of the diaper to form an extra barrier for escaping moisture. The sewn in soaker is my favorite feature about this diaper! I found that this diaper gets softer and more absorbent after every wash.
Nommy's Nappies, Small Petite All-in-one diapers fit approximately 8-20 pounds. Eli is 2 months old and about 13 pounds. I probably could get away with using the middle rise but I love the full fit on my chunky little guy. Rolled leg elastics expose a thin strip of waterproof PUL to the inside of the diaper, keeping the leg holes nice and gentle on baby's thighs. I love how trim this diaper is! Fits perfect under any pants or shorts. Hands down, Nommy's Nappies are very well made. You can tell there is a lot of time and love put into making these diapers. It is one of our favorite diapers in our stash and one that I always reach for first. We have not had one leak yet and even used it at night a few times. I plan to add more to my diaper stash! 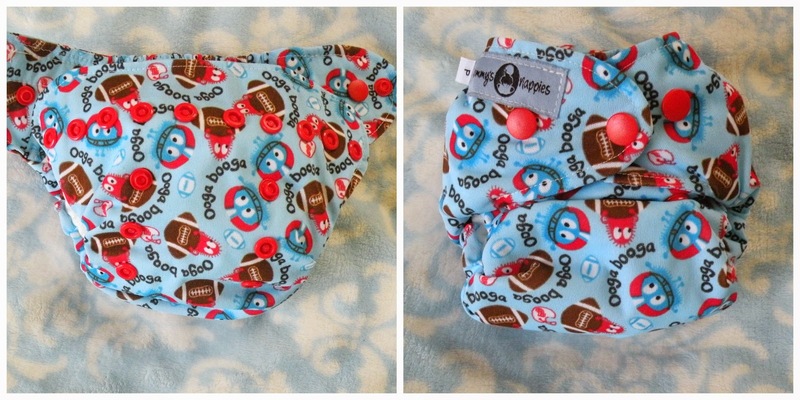 Find Nommy's Nappies on Facebook and Etsy! You can also find her in Diaper Frenzy Congo Group on Facebook, where she mostly stocks. 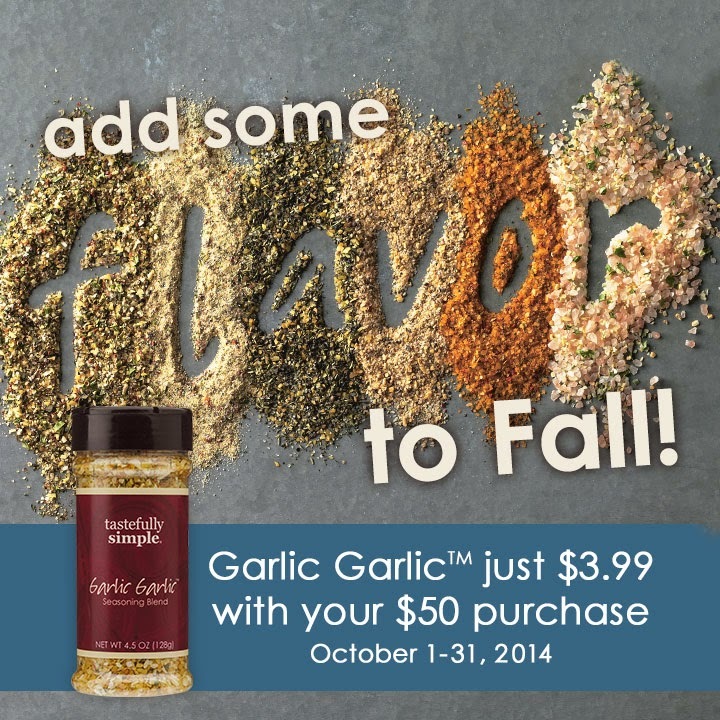 Disclaimer: I was given the products in this post at a discounted price for the purpose of my honest review. I was not paid in any way to write this review. Review is sponsored by Nommy's Nappies. 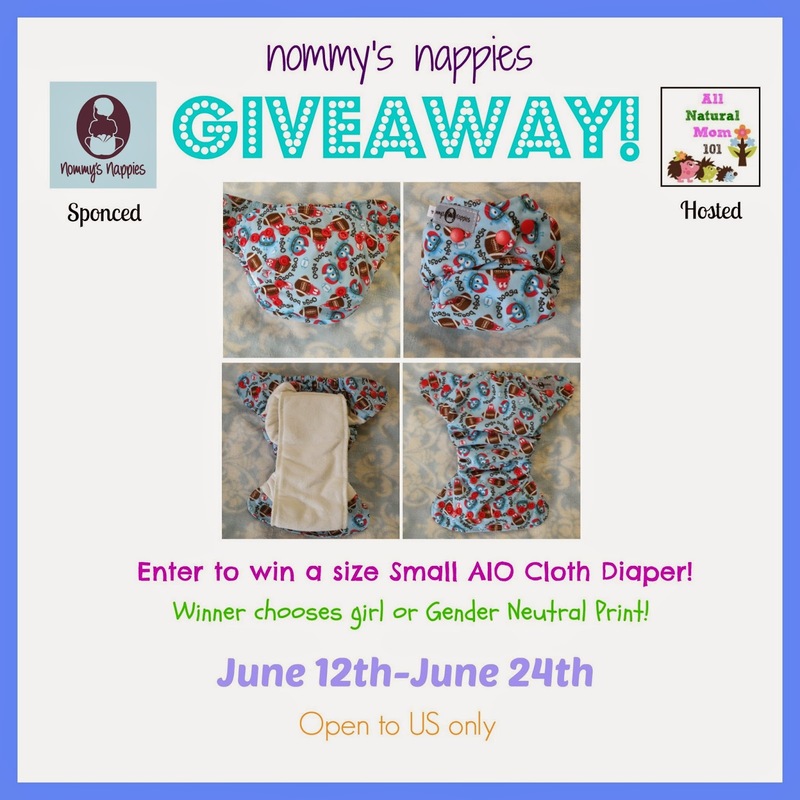 One lucky reader of AllNaturalMom101 will win a Nommy's Nappies size Small/Petite All-in-One Cloth Diaper. Winner will get to choose between a girl or gender neutral print. Diaper approximately fits from 8lbs-20lbs. I like the reduction of landfill waste, not using chemicals on my baby, and the cute factor! I love her diapers. So happy she's coming out with a petite OS size. I like the savings you get compared to disposables! I leve NOmmy's nappies. I have a pocket nappy, it's fantastic.! I love the savings and how good it is for the environment. Love Nommy's Nappies. First WAHM diapers I purchased. Only been cloth diapering for 6 weeks, but i love all the cute prints and not wasting so much money on diapers. We will start cloth diapering in September when our first is born, but so far I love the cuteness and savings! I love that they are environmentally friendly and adorable! I love the green aspect! I love how they are even easier than disposables. I love how darn cute they are! Plus the reduced diaper rash and poopie blowouts are awesome! I love that no wetness touch DS after number 1. CUTE, healthier, better for everyone! It is so weird how much I love them! I love avoiding the smell of disposables!